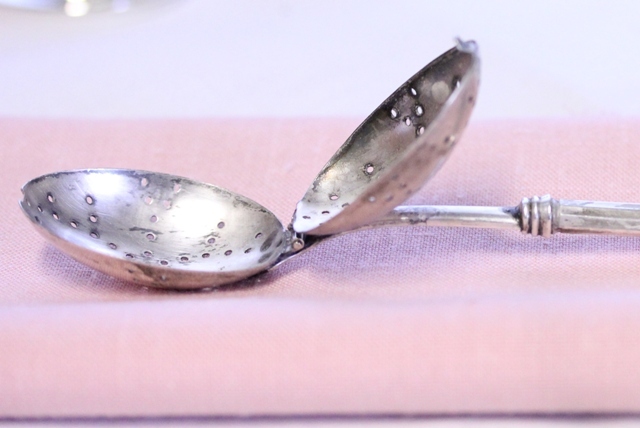 This last weekend while I was visiting my mother, she gave me some heirloom silverware that has been in my family for over a hundred years. This week I have been cleaning and touching and doing research on the silver pieces that I have admired since I was 10 years old. When I was young I would look at the spoons on the spoon rack and sometimes I would be able to touch them. Now I am blessed that I can study each piece under a magnifying glass for as long as my heart desires. The tea cup is Elizabethan Fine Bone China from England. The roses are 'Tiffany' a Hybrid Tea Rose from my garden. 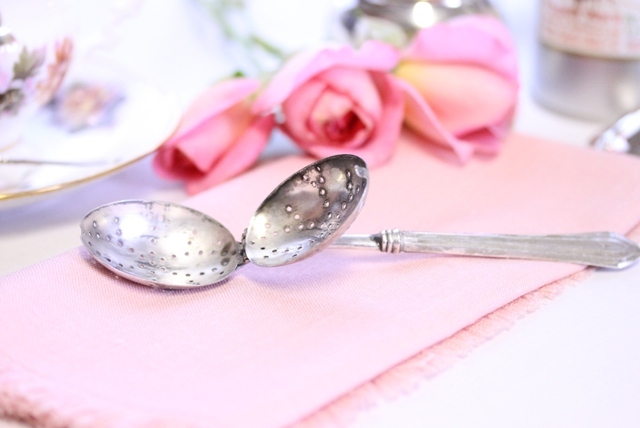 A Sterling Silver tea caddy spoon is in the loose tea. 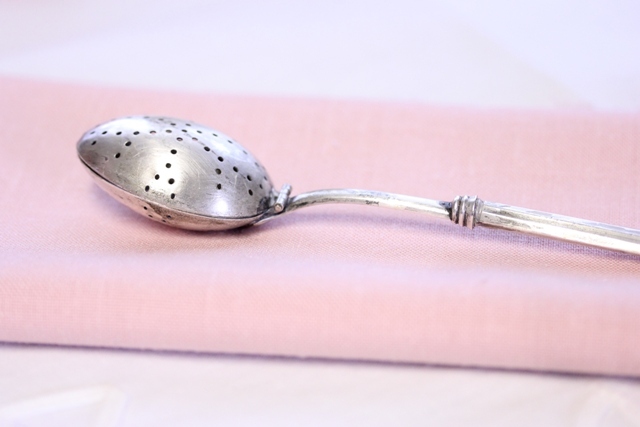 The teaspoon is Silver-plated by Hamilton Manufacturing Co. and the Sterling Silver loose tea leaf infuser is one of My Favorite Things. The top slips of the hinge for easy washing. I love the twisted handle. I'm joining Bargain Hunting with Laurie for A Few of My Favorite Things Saturday. Please link back to the wonderful parties I have joined. And, I would love if you leave a comment and become a follower. I love to answer and say thank you for visiting My Cozy Corner. Hi Betty! You are a lady after my own heart! I love everything about "taking tea" and think I might be an Anglophile (is that the way you spell that word that means someone who loves all things British?) at heart! Thanks so much for linking this up to the party this week! Betty this is so lovely. I love the antique silver also. Your blog is coming along, beautifully. Oh I so love your tea setting. The beautiful cup and saucer and the silver. I saw pink roses on your thumbnail and had to stop by. Very lovely. 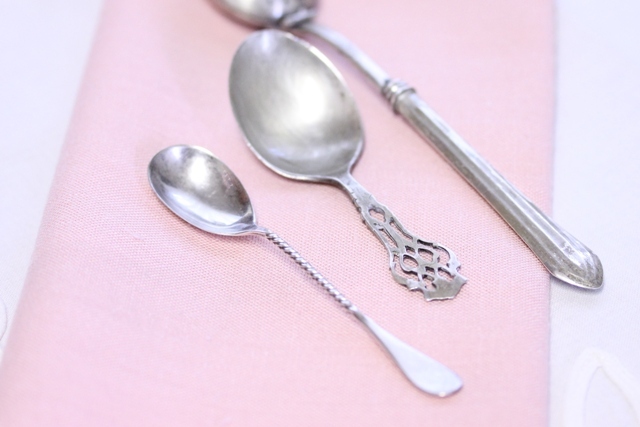 What beautiful possessions to be passed down from your mom...love the twisted-handle spoon! I came by to visit and welcome you to your first Pink Saturday. I am glad you decided to join us. Your setting, your pieces and your photography are stunning, and I know they must be treasures for you. I would love to share a cup of tea with you. Such pretty things. I really get my fix on pretty on Saturdays. I'm surrounded by Testosterone here. Thanks. have a great day. I am visiting from Pink Saturday....wanted to welcome you to all the wonderful pink fun. Your post is beautiful. 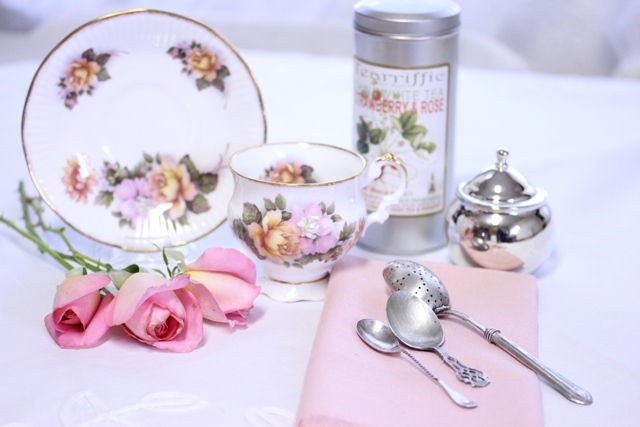 I LOVE pink, silver, and teacups, so this was totally lovely to me. In fact, it would be a perfect post for the Tuesday tea parties here in blogland. How exciting that that beautiful silver is now yours. Hello Betty, Happy Pink Saturday. I see you know how to have tea. Beautiful pieces. Have a wonderful weekend. Happy Pink Saturday! I love your pretty silver and the lovely teacup! My mother just gifted me with her silverware too which she had gotten for a wedding present from my grandparents. I am delighted to have it as I know you are to have yours! You have some wonderful pieces! Have a wonderful weekend. Welcome to Pink Saturday, Betty. I, too, love taking tea. 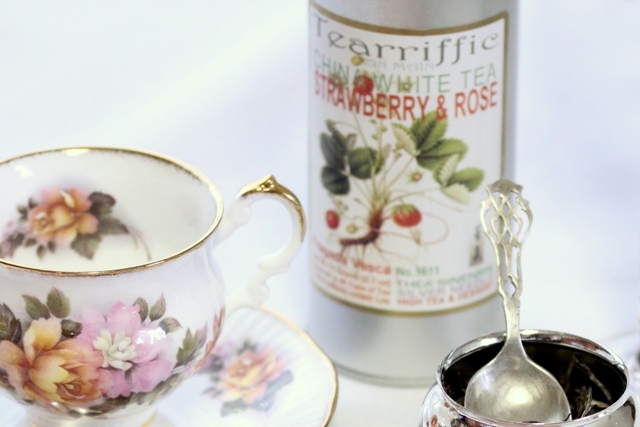 Even though I have over three hundred teacups in my collection, I am southern and love my tea icy cold. Your cups are beautiful and I have a spoon just like your twisted one but I have never been sure what it was to be used as. What a beautifully elegant post. I love that tea infuser. You make me want to go pull out my pretty china cups and make myself a cup of tea. Isn't it great to finally receive the family pieces we admired as children? 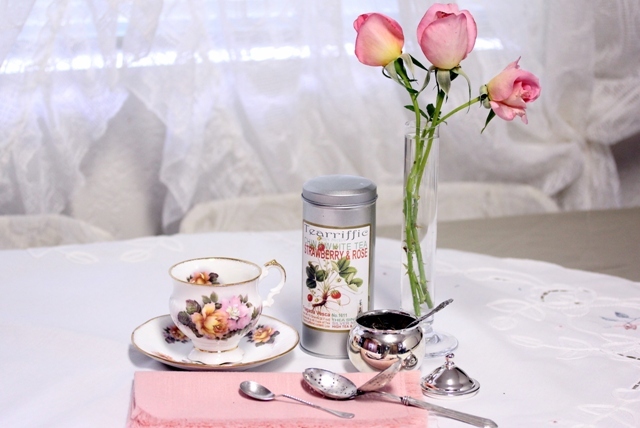 And there is nothing like a cup of tea in a china teacup with silver spoons. Welcome to Pink Saturday. What a beautiful post - I love all your treasures. I too have a silver tea leaf infuser I picked up at a thrift store or garage sale several years back - I think I'll get it out, polish it up (it's very tarnished from lack of use etc.) and use it today! Thanks for inspiration, welcome and Happy Pink Saturday! Lovely treasures and perfect for Pink Saturday! Welcome to Pink Saturday! How nice that your mother thought it was time to pass on these lovely heirlooms. Some of my most favorite possessions are things that have been in the family. Your silver pieces are just gorgeous! My BFF CC would LOVE everything about this tea setting. SHe's a tea lady. I'm a coffee girl, but would love a pretty cup and saucer just like yours. Welcome to Pink Saturday. 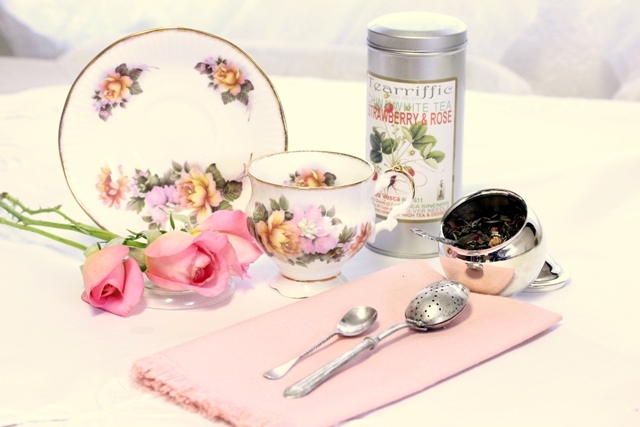 Beautiful pink tea setting. Enjoy your weekend. Welcome to Pink Saturday. Look at how many lovely comments you got. I think the Pink Saturday ladies are the most gracious bloggers out there. They are so great to the first timers. Take time to hop back and visit them. I have gotten into silver collectibles since I have started blogging. I can't believe all of the precious things there are out there, such specialized pieces. Yours are beautiful and you displayed and photographed them in such a lovely way. Hope you have had a wonderful first Pink Saturday. Happy Pink Saturday. 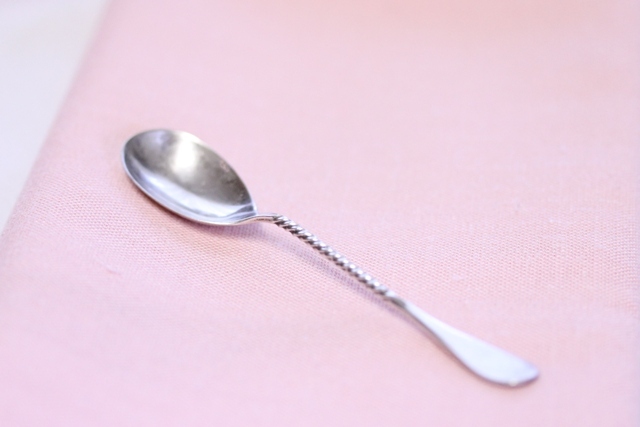 Love your spoons and the table setting! So pretty. Hello! What a gorgeous post! Love your silver and that teacup is deelish! Welcome to PS (my apologies for running late...I was out of town & am just catching up). 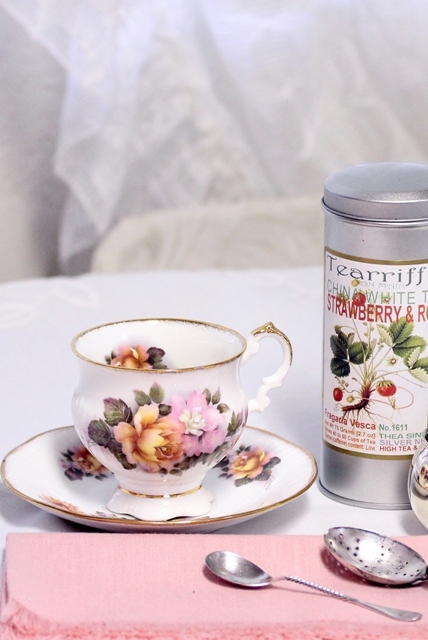 Hubby & I love tea but I have to say i've never heard of Tearrific! Is it tasty? Your pictures are lovely. What a lovely post. Happy Pink Saturday!